I know what you're thinking. What does the library in downtown Monrovia have to do with parking for the Haunted Hikes in Canyon Park? The short answer is: Everything. The long answer is: Unlike every other year of Haunted Hikes, there will be NO HAUNTED HIKE PARKING AT CANYON PARK THIS YEAR. Sorry about the yelling, but this is important. This year you will park at library park (plenty of free public parking around there) and be shuttled in the "Ghost Bus" to Canyon Park for your scheduled hike, then shuttled back again to library park. This is a change we've wanted to make for a few years now. If you've gone to a Haunted Hike before, you'll understand why. Canyon Park has a very limited number of parking spaces and getting everyone in and out for scheduled hikes was just a stressful, congested mess. This should make for a much more enjoyable experience. The shuttle is included in the ticket price. Just to reiterate, your Haunted Hike experience will start and end at library park. Please don't drive to Canyon Park, you won't be able to get in and you might miss your hike. Registration (check-in) will take place at library park (remember, you must have already pre-purchased your tickets). Please arrive at least 30 minutes prior to your scheduled hike time to allow for registration and shuttle to Canyon Park. -Monrovia Library Park is located at 321 S. Myrtle Avenue. 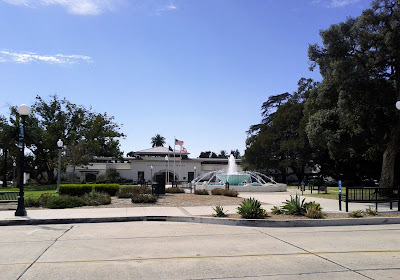 -The shuttle bus (Ghost Bus) will pick you up and drop you off in front of the library park fountain (pictured above).